H.J. 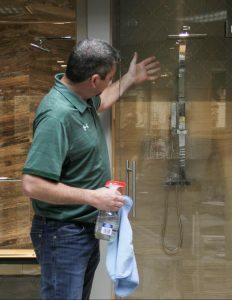 Martin and Son played host to more than a dozen area builders on January 15 for an educational event on Shower Doors. Sponsored by the Brown County Home Builders Association, the CEU course was conducted by Tag Gunnlaugsson, the company’s in-house shower door specialist. He told the builders about the variety of available shower-door options, whether for a shower module or for a tile shower. Gunnlaugsson also answered questions posed by a handful of the attendees. Gunnlaugsson explained the current trend is that showers and shower doors are getting bigger, though he cautioned that there are size limits because the attached tile only can withstand a certain amount of weight. Among the other bits of knowledge he shared with the builders is that shower-door hardware can be matched to existing fixtures, and there are a variety of color selections for new fixtures. He added that patterned glass is available for additional privacy within the shower unit, and custom etching also can be done on the glass for a distinguished look. Traditional shower doors can be utilized in creative ways, according to Gunnlaugsson. These uses include as wine room doors and for offices and exercise rooms where transparency is desired. For those seeking a truly distinctive look, Gunnlaugsson discussed with the builders the option of barndoor-type sliding doors on rollers. Gunnlauggson demonstrated the value of having H.J. Martin and Son add a clear glass coating on a shower door. Gunnlauggson also stressed the importance of ongoing maintenance and cleaning to prolong the life of the product. Soaps and shampoos, along with iron and other hard-water minerals, can degrade the shower door by seeping into the glass over time and causing corrosion. It is best to utilize a clear glass coating on the shower door, he said. Pre-applied by H.J. Martin and Son prior to delivery, it provides a seal, and the water will bead up and run off easier. Also, using a squeegee after every use of the shower will keep cleaning to a minimum. Edward Martin, president and CEO of H.J. Martin and Son, reminded the assembled builders that the company additionally offers cleaning services to consumers. Gunnlaugsson told the builders that all of the available shower door options are on display at the H.J. Martin and Son showrooms in Green Bay and Neenah, Wis. An advantage over big-box retailers, the company’s in-house designers work closely with the client and bring a higher level of knowledge and customer service, he added. It takes approximately two- to two-and-a-half weeks from measurements to installation of a new, custom shower door, according to Gunnlaugsson.